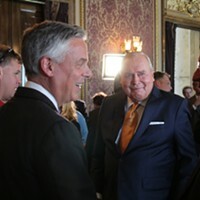 Jon Huntsman Sr. (center) at the ceremonial swear-in of his son, Jon Jr. (left), as U.S. ambassador to Russia last October. During high school, I took a summer job building chicken coops in Riverton. There was no tomfoolery because Paul and Marlow Woodward worked right along with us. The Woodwards were old egg farmers from Franklin, Idaho, who had recently partnered with the Olson Brothers forming a new entity called Oakdell Egg Farms. The Olsons earlier had hired a young man named Jon Meade Huntsman, who would soon devise a packaging solution that broke fewer eggs in the packing and shipping process. Those were big coops, those chickens laid lots of eggs, and fewer broken eggs meant a better bottom line for everyone in the egg business. By winter, the coops were full of egg-laying chickens. My buddy Jeff Tibolla and I took weekend work in the hen house where the eggs were processed. Jeff's job was to take each fully loaded egg carton and pack them into boxes to be ready for shipping. My job was to make sure the eggs Jeff got were packaged into the right container. I'd pull them from a giant room stacked floor to ceiling with egg cartons. Each carton was labeled with a particular egg brand or supermarket. If one store needed 1,000 dozen AA eggs and another needed 150 dozen AAA, I'd search for the right cartons and feed them into the appropriate slot on the egg sorter. Some eggs that came down the conveyor belt were the size of lima beans and others the size of bocce balls. If you think life comes at you fast, try thousands of eggs. Everything that made it through various screenings and weigh stations had to be packaged properly. Huntsman's solution was to switch from the hard, paper cartons to more flexible polystyrene (Styrofoam) ones. Patents filed on those molds and cartons changed the industry. Similar Huntsman foam packaging was already developed for the Big Mac. In 1971, I earned maybe $2 an hour hammering the coops together and stacking eggs. That's the closest in net worth I ever was to Jon M. Huntsman Sr. It was also the first time he and I were involved in the same industry. The second time occurred when his son, Paul, purchased and became publisher of The Salt Lake Tribune just over a year ago. Thanks to the turbulent fortunes of the newspaper industry I became fully vested in, I'm worth about the same now as in 1971. And Jon? Well, Jon did just fine. Huntsman became a beloved billionaire philanthropist due to an extremely dedicated work ethic combined with a willingness to literally bet the farm on new ventures. He sat many times where nearly all entrepreneurs eventually sit, wondering what move to make next, from where the financial and emotional support will come, who will turn their backs and who will lend a hand, friends made and friends lost. Always knowing the three steady barometers of business success—fear, luck and time—will either run out or become an ally. He mortgaged everything he had over and over again to make payroll, pay bills, expand, and, ultimately survive his business. His willingness to bet it all on a vision only he could see defines an entrepreneur. That he did means that thousands of people are still living and thousands more were given the greatest care possible as they fought through the evil malady of cancer. He created one of the finest cancer treatment and research facilities in the county, the Huntsman Cancer Institute. Nearly everyone reading this knows someone who has been treated there—and there are many more who know someone being treated for cancer elsewhere who also benefits from the institute. He had time to fight cancer—and he had time for us. We first learned that Jon was a fan of this newspaper during the 1990s. Like many Salt Lakers at the time, he diligently followed our coverage of the Bonneville Pacific scandal, the largest financial legerdemain in Utah up to that time, but which all other media shied away from. A runner for him picked up weekly copies at our office nearly as soon as they arrived. For more than 20 years, I've known him to be a champion of a free and independent press. Then, in 2004, I got a handwritten note from him offering insight and kind words of encouragement. We'd never met nor spoken prior. The note remains framed in my office. We'd eventually meet and speak numerous times, each time my mind emblazoned with how willing he was to listen and to learn; that he'd find time to honor a Bingham boy slug like me. He was also a special, dear friend and mentor to my daughter, Eleni, who came into his sphere via regular contact at her workplace. My son Mikey is a Sigma Chi. My dad was born in Blackfoot, Idaho. My mother still has several of the 1960s era dollar-bin record albums Huntsman distributed and sold in local stores like Grand Central. We share numerous friends and crossed paths in every manner. Last fall, during Best of Utah season, our readers voted Huntsman the Best Utahn. He was so thrilled, he offered to pay for our awards party. We declined. He attended with all other manners of City Weekly misfits and success stories. He got up to speak, got a standing ovation and left many in the room crying, recognizing that Jon, the barefoot billionaire, was just like them. He rose from nothing and encouraged all of us to rise, too. He told me how much the award meant to him and how it so humbled him. In that moment, I laid down my hammer and understood how it felt to be a billionaire. 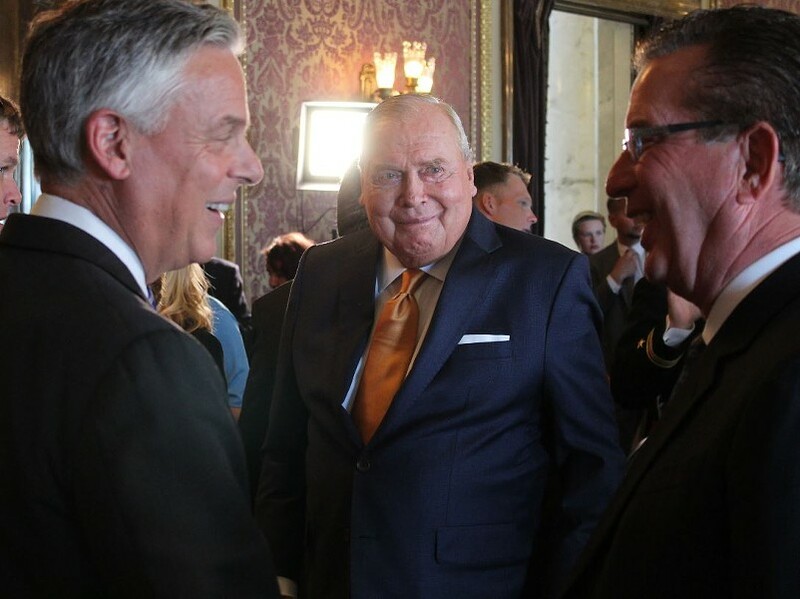 Utah will forever miss Jon M. Huntsman Sr.